Performance Brokerage Services Facilitates Sale of Legendary Kimball Motor Company. For Immediate Release, May 5, 2012 – San Luis Obispo, Ca – Following 57 years in the driver’s seat, James W. Kimball hung up his keys for good earlier this year. However, Performance Brokerage Services stepped in to ensure that Kimball’s institutional dealership would not be joining him in retirement. If there’s an example of the American Dream, James W. Kimball is it. In 1947, Kimball’s father founded an auto dealership group, Kimball Motor Company, which enjoyed almost seventy years at the helm of the Kimball family institution. The company has grown to become a force in California’s Mercedes-Benz, Chevrolet and VW scene, as the dealership enjoyed over six decades of success. However, with James W. Kimball having earned his retirement many years ago, first taking over his father’s business in 1959, the automobile veteran finally decided to set the parking brake for good and enjoy life’s third age. As one would imagine, Kimball Motor Company was steeped in decades of tradition, staple and history. Holding the accolade of San Luis Obispo’s first automobile dealership, the area was fearing losing a hub of activity it had grown to love and trust. In its favor, San Luis Obispo is one of the most sought-after automobile markets in the State of California. Coupled with a stable and affluent population, as well as being a captive ‘single point market’, Kimball was confident he could find a sale through the right car dealership broker. 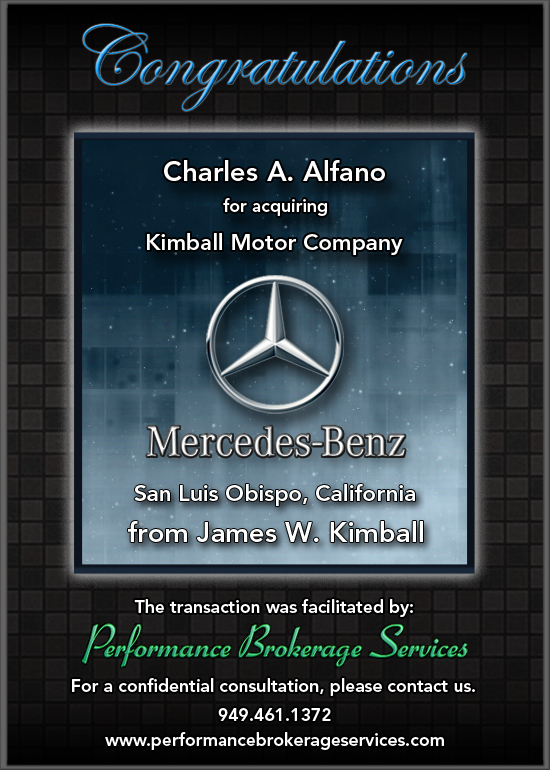 Thankfully, Kimball found success through Performance Brokerage Services, an Automobile Dealership Broker who successfully facilitated the sale to Charles A. Alfano, Jr. who had no plans to move his newly acquired Kimball Motor Company from its longtime home. During the early 1990’s, Alfano worked as a field representative for Mercedes-Benz USA. Later on Alfano stepped into the shoes of General Manager of South Bay Mercedes-Benz in Torrance, California which was later on sold to AutoNation. While Kimball Motor Company will be the first direct dealership acquisition for Alfano, his vast experience and proven track record is poised to allow the dealership to continue its good work for many years to come. “With someone as experienced as Mr. Alfano, we are confident that sales volume at the dealership will increase dramatically” says Moshe Stopnitzky, President of Performance Brokerage Services. With progression and growth firmly on Alfano’s mind, it is expected that the new dealer will construct a new Mercedes-Benz Autohaus facility as well as a new facility for the Chevrolet. “This acquisition opportunity was a prestigious car dealership for sale. Mr. Alfano will no doubt take it to the next level. The construction project will form the first phase of the planned growth. The Kimball family are famous for their passion; a passion which allowed their business to become a household name. Mr. Alfano will be able to build on this and ensure that the Kimball family legacy continues to put people behind new cars for six more decades” Stopnitzky says. Performance Brokerage Services, an Auto Dealership Broker company, was formed because a change was desperately needed. It was time for a new approach to dealership brokerage and intermediary services to auto dealerships. In recent years, the market conditions have shaken the automotive industry to its core. For many car dealers, it has meant major changes and shifts in business models in order to stay viable in this business. During the last three years, transactions were more difficult to consummate: unstable business valuations, larger gaps between sellers’ needs and expectations vs. buyers’ willingness to pay the price, a substantial decline in dealership real estate values, realignment of franchises and lack of business financing. All have contributed to limited buy/sell activity in the market place. Dealers rely on qualified and established Auto Dealership Brokers to assist them through these complicated decisions, as to some, it may represent the majority of one’s net worth. The key principals of the company have been involved in well over 400 transactions! Moving forward, Performance Brokerage Services believes that the worst is over with, the market has stabilized, demand for dealerships is again real strong and if the first quarter of 2012 is any indication, this year should turn out to be a great year for the Automotive Industry.